you created the world and all the people who live in it. and they show us how Your Spirit can live in human hearts. We call them saints because they show a great likeness to Your Son, Jesus Christ. and especially the Queen of all the saints, the Virgin Mary. 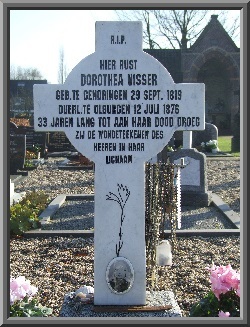 We also remember Your servant, Dora Visser. she showed interest in and compassion for the people around her. She knew herself to be united with Jesus Christ, also through her sharing in His suffering. we ask that we may continually turn to the example of Your saints. in our own needs, and also in the great needs of our world. We ask you this through your Son, Jesus Christ our Lord, who lives with You and the Holy Spirit, one God, for ever and ever.